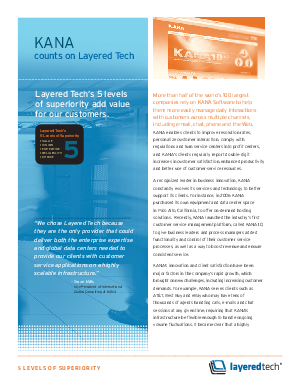 White Paper Published By: Layered Tech, Inc.
With half of the world’s 100 largest companies relying on KANA Software to manage daily interactions with customers via email, chat, phone and the Web, KANA determined that outsourcing to a global cloud provider with a highly scalable IT infrastructure was essential to their continued growth and client satisfaction. KANA chose Layered Tech because they could deliver both the enterprise expertise and global data centers needed to provide KANA’s clients with customer service applications that scale according to their customer base. “Layered Tech had a solid cloud strategy in place, and unlike other cloud providers’ one-size-fits-all platforms, Layered Tech’s virtual private data center solution is portable and flexible enough to meet all of our current and future infrastructure needs,” said Stuart Mills, vice president of global consulting at KANA. “Layered Tech has been highly responsive and has already delivered a lot of value. They customized their managed services offering to supplement the areas where we needed help, blending our skill sets with theirs instead of pushing unnecessary services on us. Layered Tech understands our unique business needs, and they are very comfortable creating custom solutions to meet our precise requirements,” said Mills. Layered Tech’s engineers created a customized package of virtual private data centers (VPDCs), managed services and disaster recovery solutions that support KANA’s clients, large and small. Layered Tech tailored the architecture to meet the highest enterprise security requirements, as well as ensuring that each KANA client can deploy applications that scale to ongoing volume fluctuations.